The Glow-In-The-Dark Golf Balls make sure you won’t have to stop in the middle of a game at twilight. This is a real golf ball that has a phosphorescent material that is part of the shell. Charging one for a single minute in the provided canister that has 15 LEDs that will provide enough light for you to finish playing. The canister is sized to fit in the cup holder of a cart, so you won’t have to worry about misplacing it or having to store it in your bag when you want to use it. There are six balls included in this package, and you’ll need two AA batteries for the canister to charge the balls. This will cost you $69.95, and considering you’re just paying for glow-in-the-dark golf balls and a light, that seems a little steep. 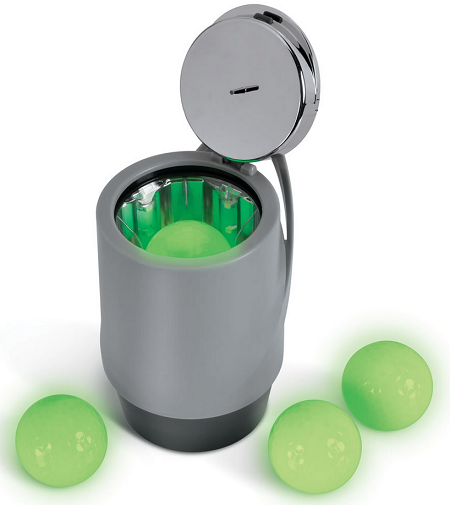 It is the convenience factor coming into play again, as leaving the balls under a light source would take far longer than using the included charger. It’s certainly a luxury item for golfers, but it would be nice to be able to keep going when you only have a few holes left and it’s starting to get dark. Hi your product is pretty awesome! If you are interested in sending me a sample of your product I will promote you on Instagram and youtube! I would tag you in every one of my videos and mention you on youtube! I would really appreciate it Thanks!